Official clay model of Jeff from EarthBound. Jeff Andonuts (ジェフ・アンドーナッツ, Jeff Andonuts) is a character originally appearing in EarthBound, as one of Ness' friends and a party member. He is the only playable character in EarthBound to lack PSI powers, so he uses guns and rockets instead. He appears as a Trophy in Melee and Brawl as well as an Assist Trophy in Brawl, SSB4, and Ultimate. Jeff as he originally appeared in EarthBound. Jeff first appeared in EarthBound. In EarthBound, Jeff is the only person in Ness' party that can use bottle rockets. There are three types of bottle rockets in EarthBound: bottle rockets, big bottle rockets, and the multi bottle rocket. Bottle rockets are one of the most effective items in EarthBound due to the large amount of damage they deliver to a single enemy. In Brawl, SSB4 and Ultimate, Jeff uses multiple bottle rockets and one big bottle rocket. The side of the big bottle rocket in Smash reads "EAGLELAND" on its side, which is the name of Ness and Paula's home country in EarthBound. Jeff seems to be sweating whenever he appears as an Assist Trophy; this is likely based on him sweating nervously on the naming screen of EarthBound while awaiting the player's choice of name for him. Ness' 1P Game ending picture. Jeff is third from the right. Jeff appears on the Congratulations screen upon completing the 1P Game with Ness. Jeff appears as a trophy in Melee. The Jeff trophy from Melee. Another of Ness's friends in EarthBound, Jeff is the only son of the famous scientist, Dr. Andonuts. Jeff is a mechanical genius, able to turn common, broken tools into complex weapons like the Hungry HP-sucker and the Slime Generator. He's a bit on the shy side but incredibly intelligent and brave in the heat of battle. 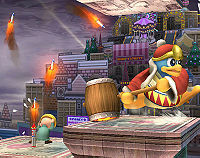 Jeff launching missiles at King Dedede in Brawl. In Brawl, he appears as an Assist Trophy. Once he sets it up and nervously takes cover, he launches four bottle rockets and one big bottle rocket, all of which home in on the nearest opponent. The number of times he does this is dependent on his summoner's standing in the current match; the lower their overall standing, the more volleys of rockets that Jeff will fire off. Regardless, there is a small chance Jeff will fire a second volley normally. The Jeff trophy from Brawl. Dr. Andonuts's son, who attends Snow Wood boarding school in Winters. He receives a telepathic message from Paula saying that she and Ness have been captured, and he sets out to rescue them. He's Ness's age but has the knowledge of an established scientist. He repairs broken items and makes them into other things. As his IQ increases, so does the number of things he can create. Jeff in Super Smash Bros. for Wii U.
Jeff reprises his Assist Trophy role in both versions of SSB4. In addition, on the Magicant stage, Jeff appears in his original 16-bit sprite form in two of the background scenes that can appear in a rip in the sky. The Jeff trophy from Super Smash Bros. for Wii U. The Jeff trophy from Super Smash Bros. for Nintendo 3DS. One of the main party members in EarthBound, he attends Snow Wood Boarding School in Winters. Jeff takes after his inventor father, Dr. Andonuts, creating devices in his free time. One of these is the bottle rocket, which fires one large missile and four smaller ones. And sometimes one extra! This boy from EarthBound is the same age as Ness and goes to Snow Wood Boarding School. His dad, the genius scientist Dr. Andonuts, was the brain behind Jeff's weapon: the big bottle rocket. It's made up of four small missiles and one large one. And...who knows? Maybe you'll even get some extra firepower out of it! Jeff as shown prior to release. Along with being an Assist Trophy in Super Smash Bros. Ultimate, Jeff also is available as a Spirit. He is obtainable in World of Light mode on the first map, in the town slightly north of Kirby's Landing Zone. In the fight you fight 3 blue Inklings who have increased shooting power. Jeff can also spawn in the battle. He has 13,200 power in the fight and is a shield spirit in the fight. As a Spirit, Jeff is a 4-Star Legendary Support Spirit with 2 Cost, and the Jam FS Charge Ability, allowing him to slow down foe's Final Smash Meter when equipped. He is spirit No. 573. Training Mode describes his Assist Trophy: Fires a volley of five bottle rockets. Can't be KO'd. Jeff in Super Smash Bros. for Wii U, alongside Ness. On x1.5 speed in Training mode, Jeff will always only shoot five missiles, four small and one big. Jeff's model does not cast a shadow in Ultimate. This page was last edited on February 11, 2019, at 22:11.